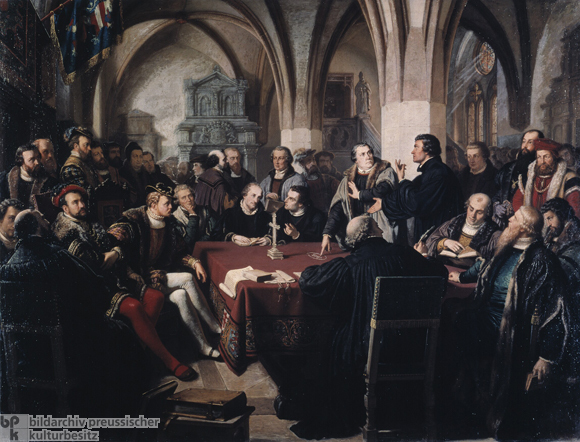 After the Lutherans raised their protest at the Imperial Diet of Speyer in 1529, thus giving rise to the name “Protestant,” the doctrinal quarrel between Martin Luther and Ulrich Zwingli (1484-1531) of Zurich escalated. In the late 1520s, this debate (and the campaign against sectarian groups) distracted Protestants from their attack on Rome and Catholicism. Landgrave Philip of Hesse (1504-67), anxious to restore unity and to form a Protestant military alliance, invited Luther, Zwingli, and others to a colloquy in Marburg in October 1529. Luther and Zwingli debated the correct interpretation of Christ’s words regarding the Eucharist – “this is my body” – with Zwingli taking a spiritualist line and Luther insisting on a literal interpretation. This nineteenth-century image shows Luther pointing to the Greek word “estin” (“is”), which is written on the table, and Zwingli pointing upwards (because Christ ascended to heaven and will return only with the apocalypse). Philipp Melanchthon and Martin Bucer converse in the background. Oil painting and drawing by August Noack (1822-1905), 1867.